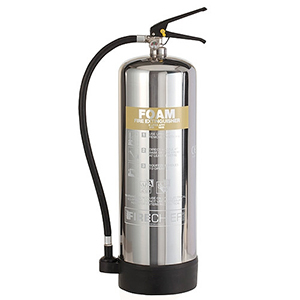 The 9 litre chrome spray foam fire extinguisher is made from highly polished stainless steel and is ideal for design led or architecturally sensitive environments. As well as this it is perfect for clean rooms or hygienic environments too. Spray foam extinguishers provide a fast and powerful means of tackling class A and class B fires. Highly effective against petrol and volatile liquids, forming a flame smothering seal over the surface and also preventing re-ignition, they are ideal for multi-risk usage. Spray foam extinguishers are particularly well suited to use in shops, hotels, offices and any location where flammable liquids are present. Spray foam extinguishers are suitable for all Class A (wood, paper & cloth) & Class B (flammable liquids) fires, but should not be used on or near electrical fires.